Researchers in Singapore can now explain what gives the mantis shrimp, a marine crustacean that hunts by battering its prey with its club-like appendages, the most powerful punch in the animal kingdom. 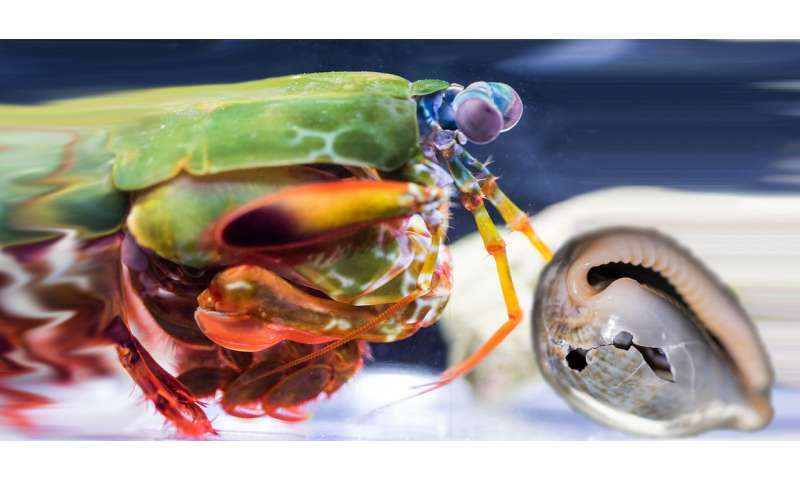 In a paper publishing October 19 in the journal iScience, they show that a saddle-shaped structure in the mantis shrimp's limbs, which acts like a spring to store and then release energy, is composed of two layers made of different materials. Measuring the composition and the micro-mechanical properties of the layers—which are mostly bioceramic and mostly biopolymeric, respectively—allowed the researchers to simulate how the saddle stores such large amounts of elastic energy without breaking. "Nature has evolved a very clever design in this saddle," says senior author Ali Miserez, a materials scientist who studies unique biological structures at Nanyang Technological University in Singapore. "If it was made of one homogeneous material, it would be very brittle. It would for sure break." 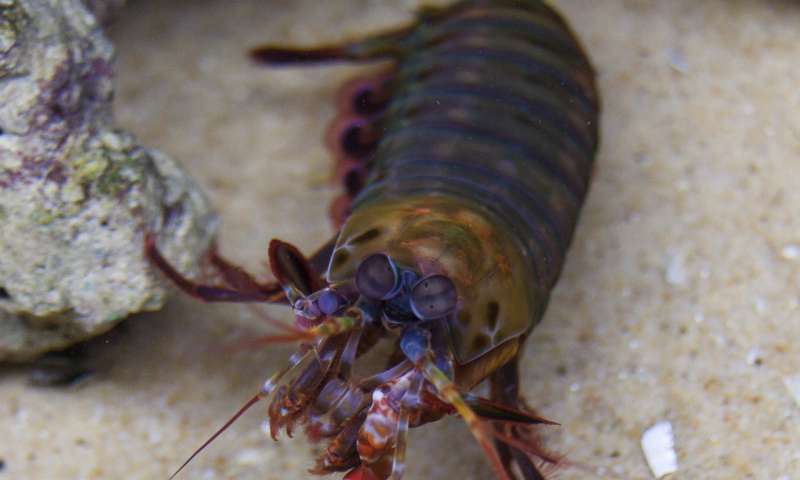 Previous research from the lab of biologist Sheila Patek had examined the mantis shrimp's dactyl clubs—the appendages they use to attack their prey—and suggested that muscles alone couldn't be creating the amount of force with which the crustaceans strike. Other research had hypothesized that the saddle might be used to store elastic energy, but studying the structure and mechanical properties of the saddle was challenging. "The movement is so fast that people hadn't been able to focus just on the saddle itself, which is why we needed to study it by computer simulation," says Miserez. His team analyzed the composition of the saddle, making micro-measurements of the materials' mechanical properties to develop a simulation of the mantis shrimp's strike. They found that the top layer of the saddle is composed mostly of a relatively brittle bioceramic similar to tooth or bone, while the underside contains a higher content of biopolymers, which are fibrous like a rope and therefore strong when pulled on. 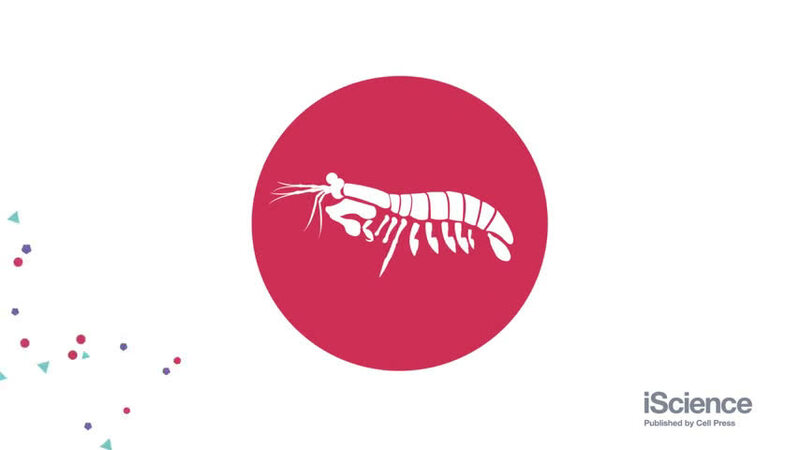 When the mantis shrimp's muscles and connective tissues load energy into the saddle, the top layer is compressed and the bottom layer is stretched, meaning that each layer is placed under the forces it is best able to withstand. "If you asked a mechanical engineer to make a spring that can store a lot of elastic energy, they wouldn't think of using a ceramic. Ceramics can store energy if you can deform them, but they're so brittle that it wouldn't be intuitive," says Miserez. "But if you compress them, they're quite strong. And they're stiffer than metal or any polymer, so you can actually store a higher amount of energy than you could with those materials." The researchers also performed a series of experiments using small strips of actual saddle structures that they cut with a powerful picosecond laser beam. They analyzed how forces were distributed when the strips were bent the way they are in the mantis shrimp and when they were bent the wrong way. When they were bent the wrong way, with the biopolymers compressed and the bioceramics stretched, the strips were less able to withstand strong forces, likely due to tiny fractures in the ceramic layer. Miserez and his colleagues are continuing to study the structure of the mantis shrimp saddle and have even started 3-D-printing some mantis shrimp-inspired springs of their own, which could potentially be used in microrobotics. "From a fundamental science perspective, the mechanics of this structure are quite interesting," he says. "But what this design also shows is that you can make a very efficient spring—and you can make it out of ceramics, which are more efficient than other materials people are using now. You can use materials that you wouldn't have thought about based on your mechanical engineering knowledge."